Happy menu planning day everyone! 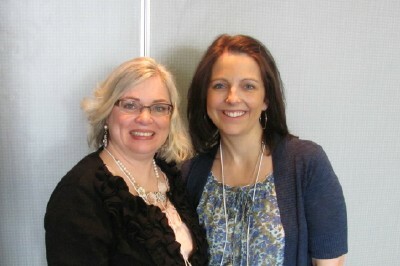 This past weekend I attended the BlogWest 2012 conference in Edmonton. It was very inspiring and I can’t wait to make some changes on this here blog as a result. I also got to spend time with the fabulous Angie from Echoes of Laughter. Here we are hanging together. 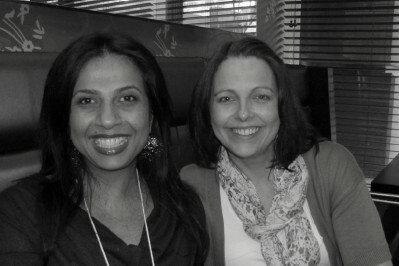 I also got to meet the gorgeous Sajida from Modern Mamas, and she told me she is one of my biggest fans! She was a hoot and we had such a great time together. She made me laugh so much especially at dinner when she kept saying “oh my gawd, I can’t believe I’m sitting beside Org Junkie!” Hahaha….I’m so happy we got to meet!! Last week a couple of my girlfriends had birthdays. 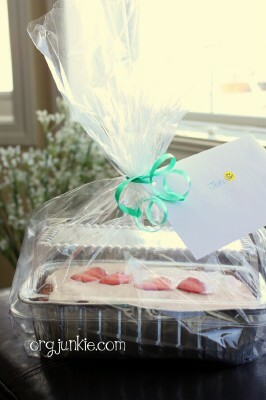 So I dug through my recipe folders to find a yummy recipe I could make as gifts. I have more baking disasters than successes so I found an easy sounding recipe and prayed for the best 🙂 I made this Glazed Strawberry Banana Bread and while I probably should have cooked it longer, it didn’t turn out half bad. It tasted delicious! Check out all the lush greenery…amazing! I promise it’s not fake. I’ve noticed that some of you are linking up to recipes only rather than to a menu plan. Please only link up if you are including a weekly menu plan in your post. If anyone else sees this happening please don’t hesitate to let me know and I’ll delete the link. Thank you! 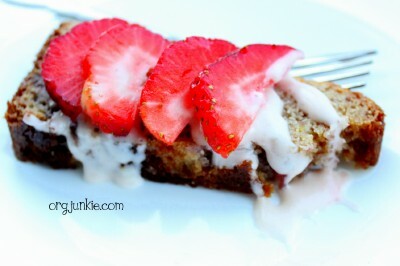 That strawberry glazed bannana bread! Lovely pictures, especially the sunset one! Nothing beats an amazing sunset! Thanks for hosting every week! I find some of my most favorite recipes here at your party! And I got married almost 16 years ago, the puffy sleeves….oh the puffy sleeves. Sigh. Have a great Monday! I just wanted to say “thank you” for hosting this. My oven is broke. Broiler works and stove top works, but the oven itself won’t heat up. ?!? Weird. Anyway, I knew I could come browse through yours and your readers menu plans and piece together lots of ideas on what I can serve up for my family this week – even without an oven. 🙂 Thanks Laura!! Well that stinks doesn’t it. Hope it gets fixed soon! Thanks so much for sharing your wedding photos!! I love the sunset one… you two are so cute! Congrats again. Praying for many more years together. Thank you, I can’t wait to go back! Love your wedding pictures. Old photos are the best. It’s fun to go back and look at them that is for sure! Ahh that’s awesome! Our hair looks very similar lol. I love a blog conference that gives me inspiration for a list of to-dos! Sounds like you got a lot out of the conference you went to. It was great to network with locals and the workshops were great too. 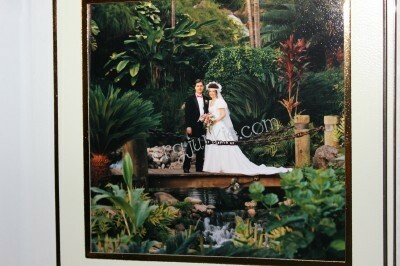 Love the wedding pictures married 17 years as well and had a similar dress! It was great meeting you! I can’t believe Im in your blog!!! LOL so exciting! Can’t wait to try the yummy meals. You look gorgeous and hilarious in your wedding pics!! ( if you can be hillarious and gorgeous at the same time, I think you can! ) Big smooch! Have a great week girlfriend! Thanks so much for linking to my baked chicken Parmesan recipe. It was so nice to meet you this weekend at BlogWest! Also…love your wedding pictures! It reminds me of when I post pics from high school in Alabama because I ALWAYS have to add a “big hair” disclaimer. The one — and only, really — thing that I feel I missed out on by quasi-eloping rather than having a “real” wedding is pictures. I really wish I had pictures from the day I got married. 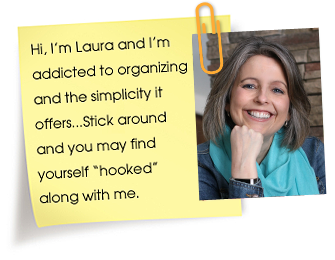 Yours are gorgeous, Laura!! We got married at the Justice of the Peace over 30 years ago! We did have a small church wedding on our 10 year anniversary, so I have a few non-pro shots from that. Congratulations on your wedding anniversary! Thanks for sharing your wedding photos. Now that I have a good scanner that’s attached to my printer I can scan my old wedding photos and share in Oct. Glad you had a good time at the blog fest, never been to one, thought about it but never would know what to do nor know anybody but sounds like fun. Have a good week! 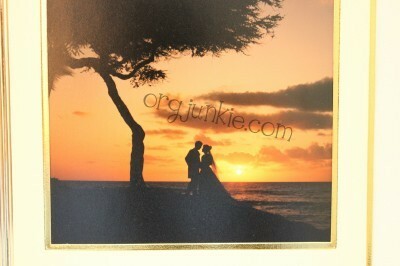 Love looking at wedding photos and yours are gorgeous, especially that last one in the sunset! Now I really want to go back to Hawaii!